Bill Granger is a familiar name to many in North America. My first encounter began with a loaf of his signature coconut bread not too long ago when I made Dad a birthday cake. 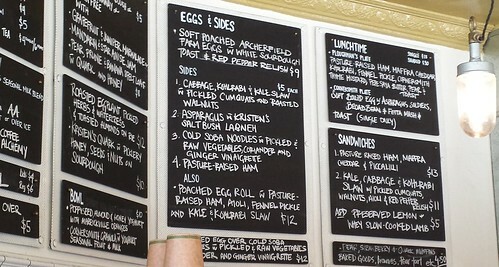 I went to Granger’s breakfast-centric restaurant bills in Surry Hills after reading high praise from David Lebovitz. It was rather strange to see a familiar recipe materialized as a menu item. But the familiarity was not the reason why I would return to bills in a heartbeat. My extravagant breakfast began with the most perfectly quivering dish of scrambled eggs (half order). The custard-like eggs was just barely set and the curds were large enough to be picked up with a fork. Every bite made me smile. 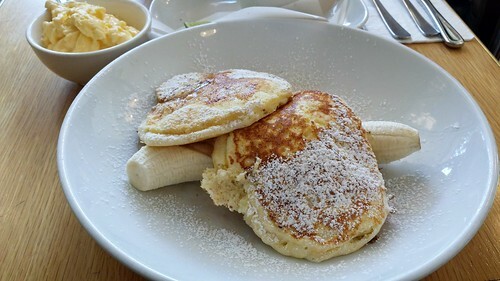 Next came an order of Ricotta Hotcake with Honeycomb Butter, Banana, and Maple Syrup. You can’t go wrong with these fluffy yet rich pancakes with the addictive honeycomb butter. C’mon, it was butter mixed with bits of honeycomb! You would think that I was stuffed by this point. Well, I could ask for the bill and be totally happy. But then I would miss out on the best part of my dining experience at the restaurant. 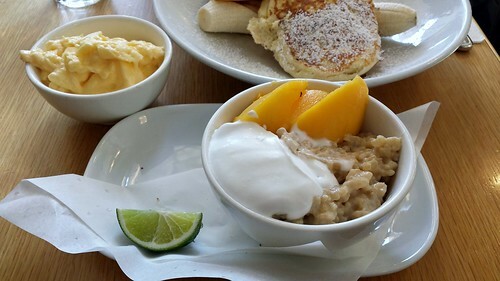 Brown Rice Porridge with Sweet Miso, Coconut Yogurt, and Mangoes looked so humble. I was not prepared for the mix of sweet and savoury punctuated with the refreshing fruit. I told myself I would only eat half a bowl since I was quite full but I just couldn’t resist another spoon. Before I knew it, I polished off the whole bowl of porridge. Oops! My breakfast selection was not limited to American or Continental. On one of the rainy mornings, I took the bus to a non-descript food court in Central Business District for Alice’s Makan’s famous char kway teow. 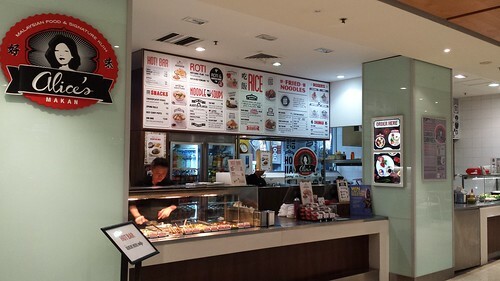 I was pleasantly surprised by the quality coming from a food court establishment and understood all the accolades for one of the best char kway teow in the city. 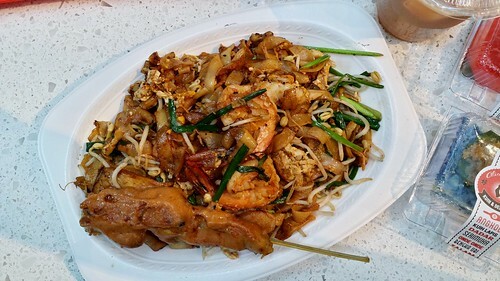 The generous plate of flat rice noodles were stir fried in thick soy sauce with seafood (big prawns! ), egg, sprouts, pork sausage, and cracklings. According to Malaysian friends, the addition of cracklings marked its authenticity. A little unusual since most typical offerings omit pork for religious reasons. Another specialty of Alice’s Makan is their dessert assortment of kuih. 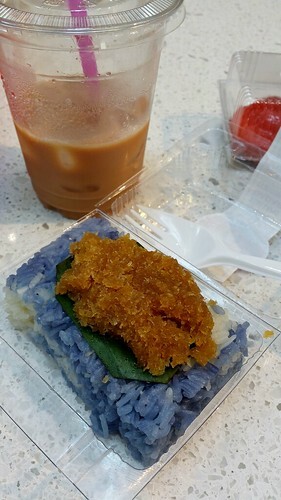 I tried the pulut inti and angkoo. 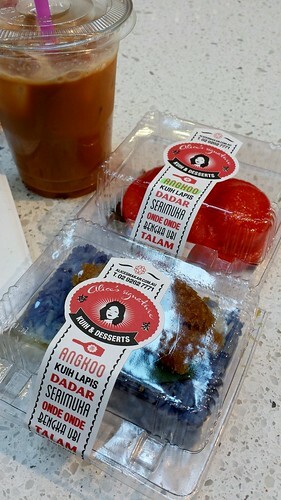 The kuih looked rustic but I loved the combination of lightly salted glutinous rice with palm sugar sweetened coconut. The saltiness tamed the intense sweetness of tropical palm sugar. The angkoo was mochi filled with mung bean paste shaped like turtles. If you grew up with Asian dessert, you would understand the appeal of sweetened bean filling. Did I mention I ate all these before noon? 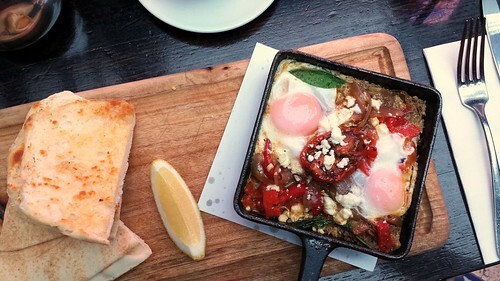 Continuing the multicultural theme, I also brunched at Kazbah for their famous Minced Lamb Breakfast Tagine made with baked eggs, roasted tomatoes, peppers, spinach, feta cheese, Turkish toast, and pita. I was little disappointed that the single-serving tagine arrived in a cast iron skillet instead of the traditional vessel. However, the taste was still phenomenal. 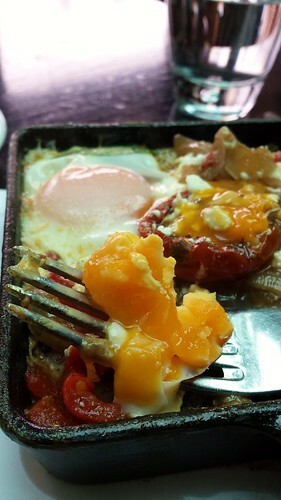 The baked eggs were done medium with a bit of runny yolk to enrich the spicy minced lamb and a bit of gelatinous yolk to smear on toast. 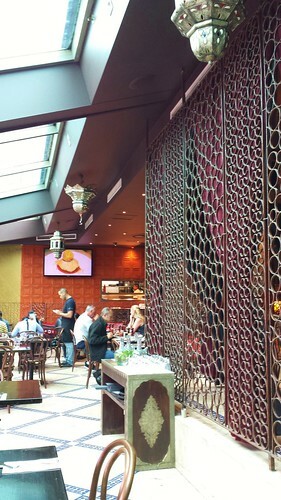 Coupled with a view overlooking the waters at Darling Harbour, no wonder Kazbah is a popular brunch spot among locals and visitors alike. 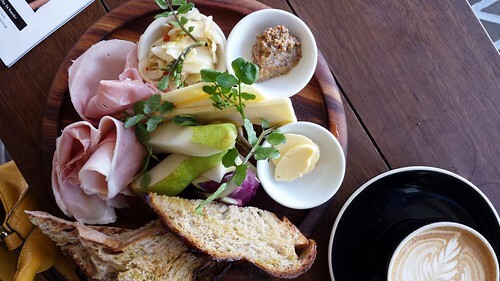 I certainly miss the holiday luxury of starting my day with brunch seven days a week. Sigh. 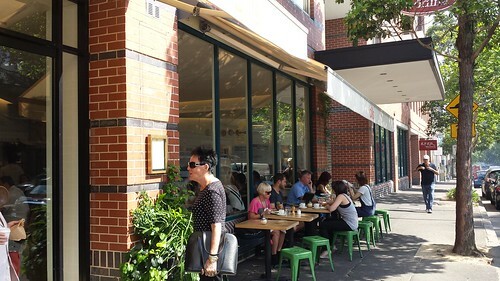 If you are interest in all the dining locations I visited in Sydney, I put together this handy map with links to my notes and contact information. Enjoy!